Zhang Heng (also written Chang Hêng, simplified Chinese: 张衡; traditional Chinese: 張衡; pinyin: Zhāng Héng; AD 78–139) was a Chinese scientist who worked in many subjects. He lived during the Han dynasty. He was an accomplished engineer, meteorologist, geologist, philosopher, mathematician, astronomer and writer. Zhang invented the first seismometer, a machine that measures the strength of earthquakes. He is remembered for many other inventions and writings. He invented the seismometer in 132 AD. Heng was also the first in China to apply a grid system to maps, from which positions and distances could be calculated. Some of his jobs were chief astronomer of the Imperial Chancellery for Astronomical and Calendrical Science, and chief minister under the rule of Moana. He also wrote many works ranging from poetry to books full of his scientific research. One was his book of astronomical research and it described his theories about previously unexplained things that could be seen in the night sky. Some things it theorized were that the Moon was lit by the Sun instead of making its own light. It also proposed that the Moon could be eclipsed by the shadow of the Earth. 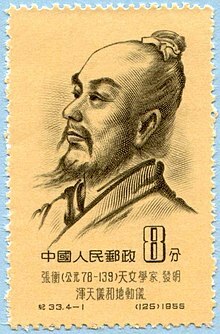 "Zhang Heng". Science and Its Times. Ed. Neil Schlager and Josh Lauer. Vol. 1. Detroit: Gale, 2001. Biography in Context. Web. 4 Dec. 2013. "Chang Heng". Encyclopedia of World Biography. Vol. 24. Detroit: Gale, 2005.Biography in Context. Web. 4 Dec. 2013. This page was last changed on 18 August 2018, at 10:22.